Dr. Marie-Eve LeBel grew up in Québec city and, following studies in physiotherapy, she graduated from Laval University Medical School in 1999. From 1995 to 2002, she had a very good experience with sports related injuries as a team physician and physiotherapist for AAA Men’s and Women’s College Basketball national and provincial Tournaments. She completed her orthopaedic surgery training in 2004 before completing a Sport Medicine Orthopaedic Fellowship at the University of Western Ontario and the Fowler Kennedy Sport Medicine Clinic. Dr LeBel worked for one year in Québec's Eastern Townships as a sport medicine orthopaedic surgeon before coming back to London as an Assistant Professor. Dr. LeBel specializes in the arthroscopic treatment of athletic injuries and disorders of the shoulder. She is completing a Masters degree in Health Professions Education at the University of Illinois in Chicago and her main research focus is in surgical simulation. 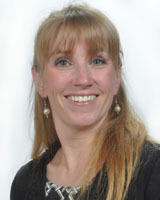 Dr LeBel has been awarded the University Student Council Award of Excellence for excellence in teaching in medicine and she represented the Canadian Orthopaedic Association as a CFBS Travelling Fellow in the Fall 2012.